Last Thursday I had a much-anticipated Korean food dinner date with my friend Allison. Allie and I met a few years ago here in Canada, but we have both previously lived in South Korea for a couple of years each, just at different times. She happens to be engaged to one of my old students' union friends, Jon, who she met in Korea, and I'm beyond excited to watch them tie the knot in July. Understandably, Jon and Allie have been pretty busy as of late, in the lead up to their big day, so snagging her for a nostalgic and indulgent evening was definitely a treat! 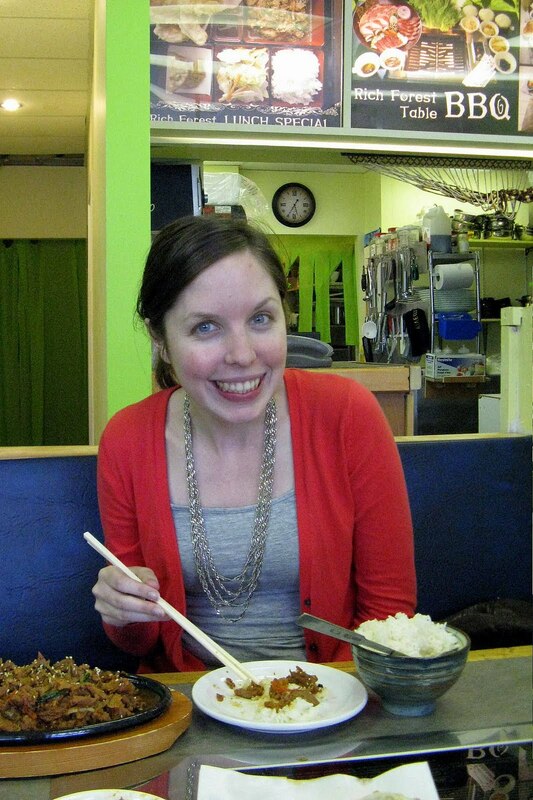 Allie has her own foodie blog (currently on hiatus due to aforementioned wedding prep), which chronicles her experimentation with a dairy, soy, and sugar-free diet. 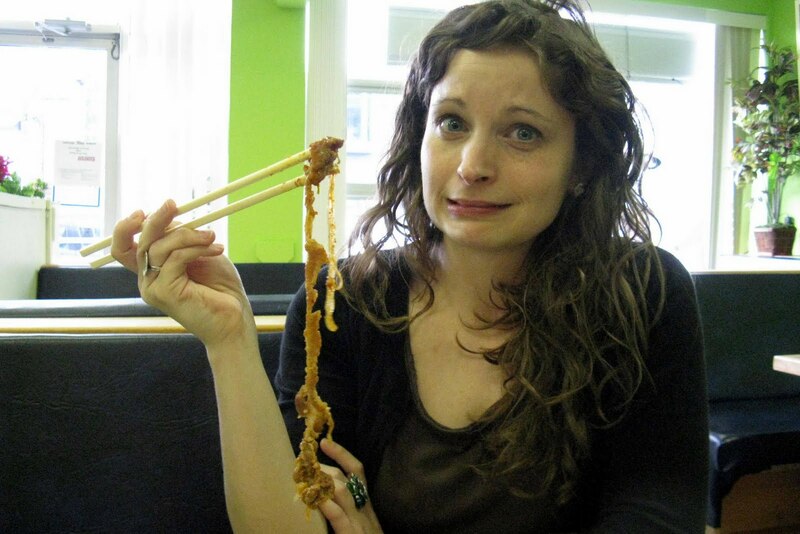 This makes our Korean food outings all the more special, since she's technically not supposed to be eating these kinds of things! Check her out at Allie's Changing Kitchen. The Rich Forest was everything a typical Korean eatery should be: splashed with fluorescent colours, fast and friendly service, lots of top-ups on water, a bin of extra-tiny napkins on the table, strange-tasting candies in a basket next to the cash, and pictures of all their food over the main counter. It was very reminiscent of places like Food 2900 or Kimbap Heaven that I used to frequent in Seoul. Hearing several conversations going on around us in Korean was nice, too: it made us both a little homesick for the country we not so long ago called home. The food was great, and very much like anything I would have eaten at any fast food (not to be confused with North American fast food) joint while there. So, in a word: authentic. Now, in saying that, sometimes authentic doesn't always equate delicious. Certainly not all, but many of the meat dishes I tried in Korea were laced with fat, but that was considered a good thing. 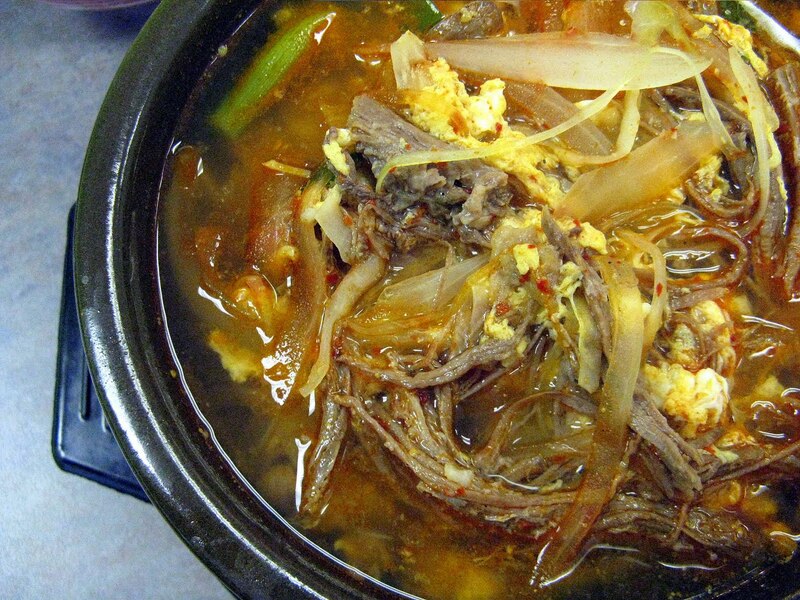 In Korean barbecue, for example, there are countless kinds and cuts of meat you can try and there is one, very popular style that is made up almost entirely of fat, called samgyupsal. It's basically the fattiest bacon you've ever laid your eyes on, but, importantly, it's considered a real treat. This was supposed to be one bite! Allie and I couldn't help but dissolve into laughter when she offered me a taste of her jae-yuk beokkeum (marinated, stir-fried pork), and the one piece I was aiming for was attached to a second piece by a very long and stringy piece of fat. I cut away the fat and the jae-yuk was delicious, but admittedly I do prefer my meat to be more lean. The other dishes we sampled were the mandu (fried dumplings) and yuk-gae jang: a very spicy broth with beef, glass noodles, and veggies. 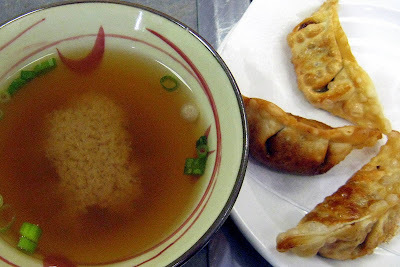 The mandu were crispy, flavourful, and not too greasy. 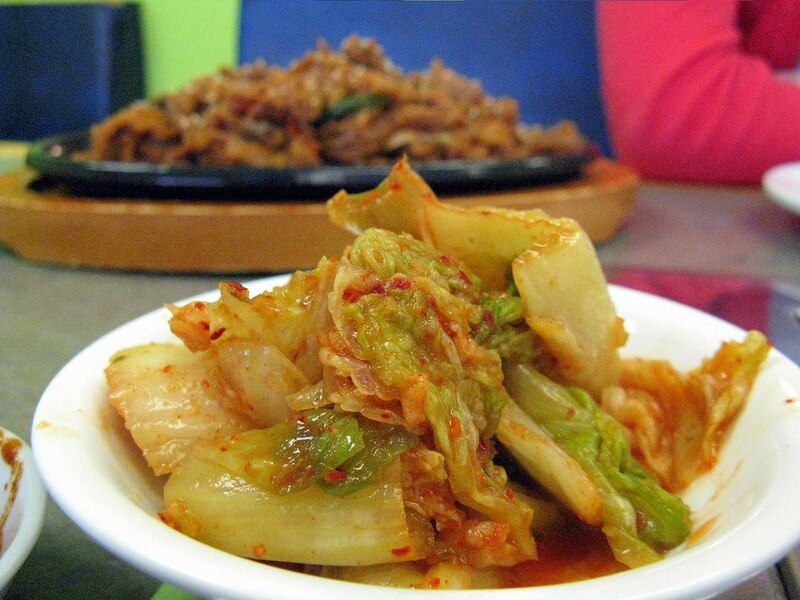 Their kimchi was some of the best I've tasted in Halifax, too. As for the yuk-gae jang, I asked our server to make mine extra spicy, because this was one of my favourite soups to order while in Korea. Rich Forest's version was delicious and stunning to look at. It definitely had kick, too, but I don't think he believed me that I could handle it, so I asked him to make it spicier for me next time. This foodie wants to sweat! All told, The Rich Forest's new location on Quinpool was a great way to kick off a weekend and satisfy cravings for good Korean food. Based on my experience eating at Seoul Restaurant (Duke Street), however, I will say that I liked Seoul a little better. 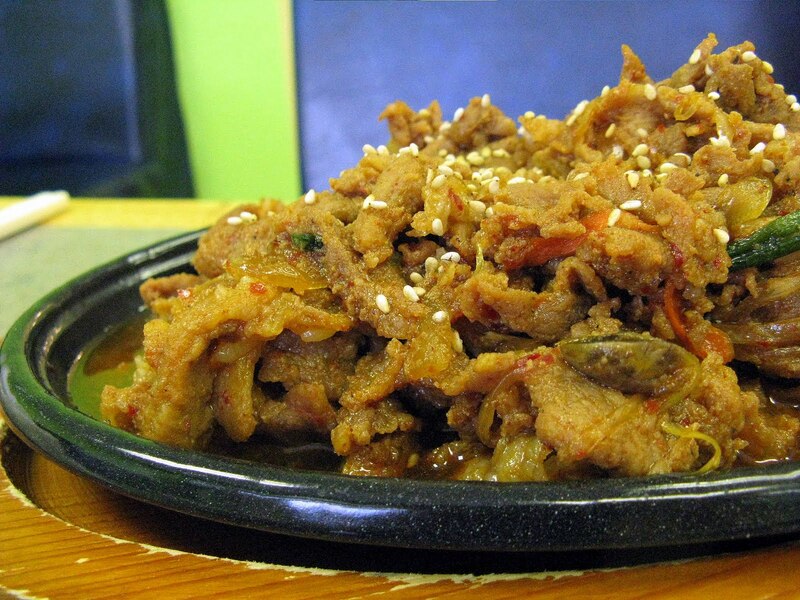 Seoul's cuts of meat were a better quality and less fatty, so I liked the jae-yuk bokkeum better there. They were also slightly less expensive and had an atmosphere more conducive to dining. I suppose, to sum it up, The Rich Forest is a great place for lunch (I love a good shock of fluorescent as much as anyone), whereas Seoul is better for a nicer, more atmospheric meal later in the day. Has anyone tried any of the other Korean restaurants in town, or the other Rich Forest location? What were your thoughts?